A woman wearing a protective mask rides on a scooter along a overpass with heavy car traffic below during a very polluted day in Beijing on Oct. 6, 2013. BEIJING – With last winter’s “Airpocalypse” still fresh in Beijing officials’ minds, politicians have introduced new guidelines for dealing with so-called “bad-air” days. The scheme calls for an alternative driving day schedule for cars with even and odd numbered license plates in the event of heavy smog. The new rules, reported late Thursday by Chinese state news agency Xinhua, calls for the driving schedule to be enforced on days when Beijing issues a “red alert” under a four-tiered pollution warning system. A red alert will be issued when the air quality index (AQI) is expected to be over 300 over a three-day period. On those days, even and odd numbered license plates will swap driving days and the capital will increase public transportation frequency and hours of service for residents. According to the Environmental Protection Bureau, such a move would force an estimated 2 million more people onto the city’s already packed buses and subway. In addition, the new system would also require city officials to share the burden, forcing 30 percent of the city’s fleet of vehicles to stay off the roads during bad-air days. The steps are not without precedent, albeit for very different circumstances. Throughout the 2008 Summer Olympics in Beijing, all of the same steps were put into place to limit traffic congestion on the city’s famously car-choked streets. Since the Olympics, a scaled down version of these traffic restrictions have remained in place, but they were meant to alleviate traffic, not curb air pollution, which has only gotten worse since the Olympic showcase five years ago. e success in dealing with air pollution, noting that particulate matter 10 (particulate 10 micrometers in size) readings across the city have steadily gone down. 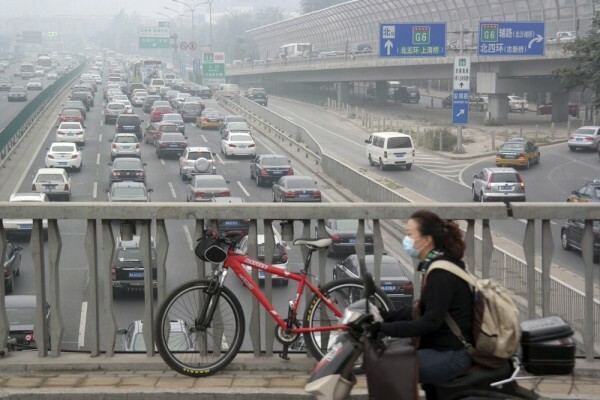 However, PM2.5, a far more dangerous particulate that originates from car exhaust has skyrocketed as more cars find their way onto Beijing’s streets. A study by the Chinese Academy of Sciences found that nearly a quarter of PM2.5 particulate found in the city originated from car exhaust. The next biggest emitter, industry and manufacturing, was also addressed in the new standards. In addition to tighter road restrictions on heavy air pollution days, the new measures call upon industrial plants and constructions sites to suspend or limit work to control particulate in the air. Even outdoor barbeques will be suspended in the event of an orange alert. Children’s safety is also accounted for in the new guidelines. On red alert days all kindergartens, primary and high schools will also suspend classes until air quality improves. Again, many of these guidelines are not new and in fact were put in place after a particularly brutal stretch of poor air quality last January. For much of that month, the AQI soared and the city was cast in a grey smoggy pall. The new guidelines will help manage the symptoms of air pollution, but greater steps will be needed to deal with the roots of Beijing’s smog problem, namely runaway car sales, expansion of heavy industries like steel production, relentless construction that kicks up dust across the capital and an addiction to cheap coal power. China’s ruling Communist Party has shown a willingness to tackle many of these issues as of late, offering up nearly $1 billion dollars in incentives to local governments to clean up their act, either through the suspension of construction projects or heavy industry or transitioning from coal-burning power plants to more expensive natural gas plants.